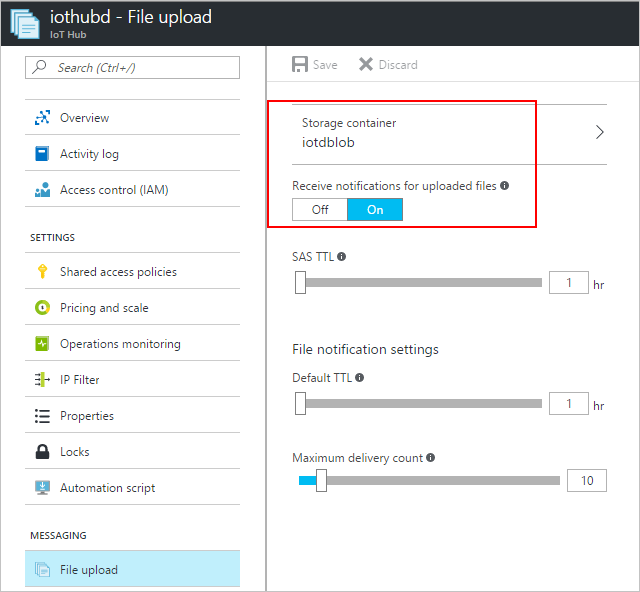 Securely provide a device with an Azure blob URI for uploading a file. Use the IoT Hub file upload notifications to trigger processing the file in your app back end. Some form of pre-processed data. These files are typically batch processed in the cloud using tools such as Azure Data Factory or the Hadoop stack. When you need to upland files from a device, you can still use the security and reliability of IoT Hub. SimulatedDevice.js, which uploads a file to storage using a SAS URI provided by your IoT hub. ReadFileUploadNotification.js, which receives file upload notifications from your IoT hub. Node.js version 4.0.x or later. Using a text editor, create a SimulatedDevice.js file in the simulateddevice folder. For the sake of simplicity the connection string is included in the code: this is not a recommended practice and depending on your use-case and architecture you may want to consider more secure ways of storing this secret. Create a callback and use the uploadToBlob function to upload the file. Save and close the SimulatedDevice.js file. Copy an image file to the simulateddevice folder and rename it myimage.png. In this section, you create a Node.js console app that receives file upload notification messages from IoT Hub. You can use the iothubowner connection string from your IoT Hub to complete this section. You will find the connection string in the Azure portal on the Shared access policy blade. Using a text editor, create a FileUploadNotification.js file in the fileuploadnotification folder. Open the client and use the getFileNotificationReceiver function to receive status updates. Save and close the FileUploadNotification.js file. Now you are ready to run the applications.